Sometimes I get tired. I have a bunch of half-finished posts that all seem like variations on the same negative themes: women are falling behind, left behind, and dropping out. It's the same reports and same arguments over and over again. I just haven't been that inspired. But I realized that what I needed was something positive to write about. Fortunately, Eugenie Scott has provided me an inspiring subject. I must have been around nine or 10 years old when my older sister brought home a college-level textbook in anthropology. I was something of a compulsive reader even then, and I casually picked up one of my sister’s books and flipped through the pages. In the middle of the book was a set of plates showing primitive-looking people with big brows, prow-like noses and receding chins. They were kind of like her boyfriend of the time actually, an observation that was not appreciated. But I was gobsmacked by the reconstructions of these early fossil humans – Cro-Magnons, Neanderthals, Peking Man and the like. This is where we started. These were the great-great-great-umpty-ump-great grandfathers of us all. It was stunning to a 10-year-old. The title of the book was Anthropology. I decided then that I wanted to be an anthropologist when I grew up. She wasn't actually taught anything about evolution in her science classes until she got to college, but she never lost interest in anthropology. After getting her bachelor and masters degrees from the University of Wisconsin, Milwaukee she headed to graduate school at the University of Missouri. It was as a graduate student in physical anthropology that Scott first became aware of oxymoronically-named "creation science" in 1971. 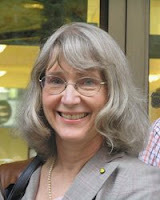 It may not have seemed significant at the time, but that started her on a path towards her current position as the Executive Director of the Oakland, California-based National Center for Science Education (NCSE), which works to keep evolution in public school science education. Over the years Scott collected creationist literature, at first as a mostly academic curiosity. It was while teaching at the University of Kentucky that she became involved in a fight to keep creationism out of the Lexington public schools. From that effort the NCSE was formed in 1981, and Scott was made Executive Director of the organization in 1987. As this evidence suggests, Scott is regularly under fire from the culture war combatants on both sides. Not only does NCSE have to monitor the endless permutations of the creationists, who are constantly coming up with new ploys for attacking evolution. It also has to deal with the pugilistic evolutionists who want to make this battle about the truth or falsehood of religious belief, rather than the truth or falsehood of what science discovers about the world. In this gauntlet, Scott has remained an eloquent defender of the view that people of science and people of religion can and must work together to solve conflicts—and indeed, this is the best and only way forward. Her position seems reasonable to me, and the NCSE's efforts seem to have been effective. I'm thankful that Scott has devoted so much of her career to fighting this fight. Quality science education from elementary through high school is necessary to cultivate the upcoming generations of American scientists. Eugenie Scott has emerged as one of the most prominent advocates for keeping evolution an integral part of the curriculum in public schools in her role as head of the nonprofit National Center for Science Education (NCSE). 2009: awarded the very first Stephen J. Gould Prize bu the Society for the Study of Evolution. Dr. Scott is a gifted communicator and public intellectual. She is a frequent guest on radio and television shows, and an eloquent spokeswoman for science. Her writings have illuminated the process of science to thousands, and her books have exposed the efforts of many groups in our society to hobble and undermine the teaching of science to our younger generation. The organization she helped create far transcends the considerable reach of her own voice, vastly amplifying her impact on public understanding. Awesome! Thanks for sharing this, Peggy. We have just added your latest post "Women in Science" to our Directory of Science . You can check the inclusion of the post here . We are delighted to invite you to submit all your future posts to the directory and get a huge base of visitors to your website.